When I tell people that I paint, they inevitably respond with, “Oh, are you an artist?” Am I an artist? The temptation is to not claim that identity until I’ve reached some future level of Monet-esque expertise. My first responses to that question were along the lines of: “No, no, I’m just learning to paint in my spare time,” or “Hah, no, not really. I just like to paint.” Now I just say “Yes” and let it hang. In the silence that follows that proclamation I find many internal voices vying for supremacy: “Who are you kidding?” “You’re an imposter!”… and “Yes, you are an artist.” That last voice started out very weak, but it has been gaining strength. Quick background to show how not-an-artist I’ve been. I graduated college with civil engineering and German degrees and then served 6 years in the Navy as a civil engineer. When I left the Navy (in 2000), I got a great job at a consulting firm and re-made myself into an education consultant, eventually earning a masters degree in education. But as a consultant and eventually manager in the world of corporate America, I let myself be consumed by the management/consulting trifecta: travel, email, and meetings. I slowly grew to realize that I had let large parts of myself go dormant. I could handle crises at work, make a sale, manage people, and maximize my frequent flyer miles and hotel points, but I had ignored my internal world. As a consequence, my relationships, my sense of community, and my work suffered. 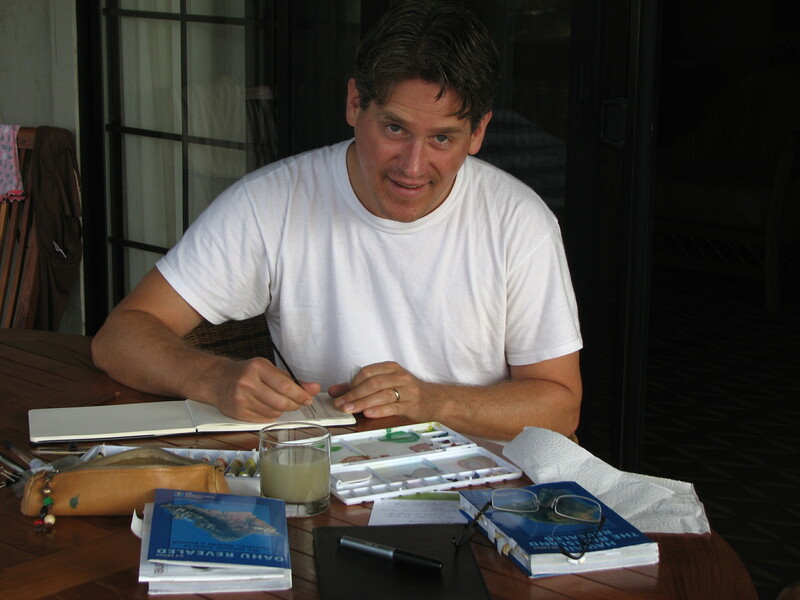 I took up watercolor painting in the fall of 2010 as one part of a strategy to re-birth my spirit and balance out the darker side of the consulting lifestyle. It’s working. Giving voice to my right brain brings balance to the strong left-brain demands of the business world, and I hope even enhances what I can bring to clients and colleagues. And that’s why I started this blog. I know I’m not the only person out there who is embarking on this journey of living into being an artist amidst competing demands. I’d like to share my experiences, and in so doing, validate what others might be going through and also hear from those who are on a similar path. I’d love to hear about your journey! Hi David, I enjoyed reading your blog and I too am on a similar journey to try and awaken my creative side and balance out my career vs creativity! I too recently went on business trip, packed in my watercolour moleskin and my travel kit, but unfortunately was not as disciplined as you and only managed one painting. I tend to lean more towards art journalling, (because it is easier! ), but you have inspired me and today the moleskine and my watercolours are coming out. Thankyou. Yvonne – Thank you for your encouraging words! There are so many times when I’m travelling (or at home, for that matter), that I choose the “entertain me” option rather than doing something that will contribute to my growth. I’ve often regretted turning on the TV, but I’ve never regretted doing a sketch or painting. Painting grounds me in the moment and provides a permanent memory of the specific time and place. And I love flipping through my sketchbook periodically. I’m glad we could be mutually encouraging to each other — we need community (even if it’s virtual) to become and remain inspired. Thank you, Kami!! And thanks for stopping by my blog. you are really the ARCHITECT of your life. Salem – Thank you for stopping by. I visited your flickr site and I love the way in which you’ve captured so much of life in your photos and drawings. I’m inferring from your drawings that you are an architect. David, I enjoyed reading your ‘about’ I’ll be keeping an eye out for your continued success. Thanks for stopping by, Matthew! I see you’re a writer — keep those words flowing!! © David Ronka and canilearntopaint, 2015. Unauthorized use and/or duplication of this material (including text, photos, or images) without express and written permission from this blog’s author and/or owner is strictly prohibited. Excerpts and links may be used, provided that full and clear credit is given to David Ronka and canilearntopaint with appropriate and specific direction to the original content.